Keep a few of your favorite potted plants watered using these Plant Nanny Blue Spiral Watering Globes with Stakes. This set of 6 terracotta stakes and glass orbs brings a stylish hint to your watering chores, while helping your plants form a robust root system. The six, 5" long, terracotta stakes insert into soil around your potted plants, and each handily supports an included glass globe. Diagonal, deep blue colored lines spiral around the orbs for a bit of aquatic style and color, and each unit holds 12 ounces of water. As the soil around the stake dries, capillary action pulls water from the reservoir into the roots, helping your plants remain nicely hydrated. This provides deep and direct watering to the root system, for a healthy houseplant. The globes remove from the stakes for easy refilling, and their transparent bodies allow you to easily monitor water levels. Add lovely color and a fun look to your plant watering with these Blue Spiral Watering Globes with Stakes. 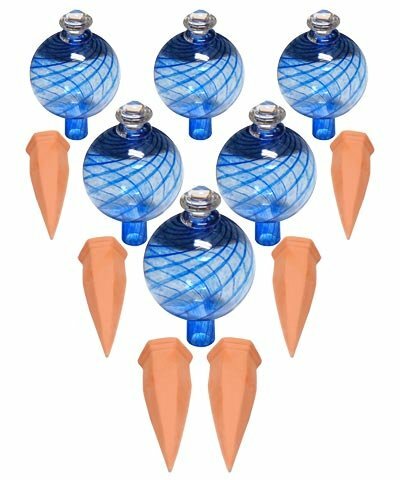 This case pack includes 6 of the Plant Nanny Spiral Watering Globes with Stakes, Blue, 12 ounces each. View More In Self-Watering Stakes. If you have any questions about this product by BestNest, contact us by completing and submitting the form below. If you are looking for a specif part number, please include it with your message.